MarlinMoz Fishing Charters puts together packages for serious anglers…in the best waters, on the best boats, and with the best crew. Throw in the best available accommodation, service and food…and you have our recipe for good times. · 3 or 5 Full days fishing (as per package option) on one of the resort´s 31ft Gulfcraft walk-around Sportfisher. basic fleet fishing out of Paradise Island, including over twenty above the magical 1000 pound barrier. opportunities, rather than the majestic Marlin of yesteryears. Still, the very few who ventured out to target those experienced exceptional results. weighted 1098 lbs, giving us the 5th win on the tournament in the last 6 years. stretch to April and fish have been caught on all calendar months, peak season normally runs from September to January. vessels stretched over the fishing grounds – actually most times you are likely to be fishing on your own. GT´s, fly fishing, vertical jigging, drop shot or any other method we are always willing to cater for every angler´s specific requirements. this method including smaller Marlin, Sailfish, wahoo, Dorado, kingfish, tuna, king and queen mackerel and a kaleidoscope of other species. single day and the chance to hook one of the various species of kingfish, that will test your angling skills to the limit, is almost guaranteed. members of the kingfish family, sharks and other´s are also regularly caught using this technique. Amberjack´s, Gt´s, groupers and various other kingfish and bottom dwellers being taken. the right conditions one can expect anywhere between 10 to 30 shoots a day on fish averaging around 70 pounds, with the area´s record being 118.5 lbs. 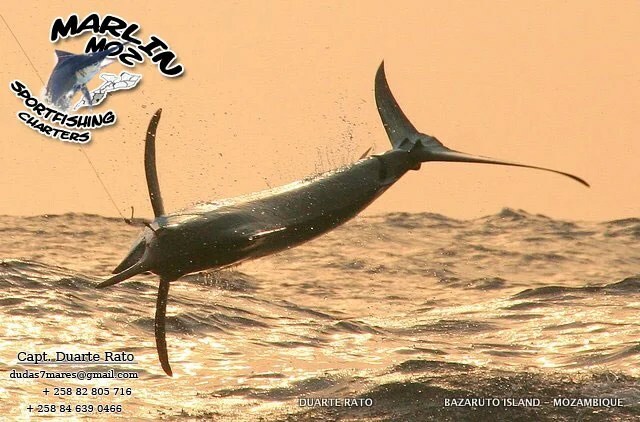 They are regularly caught as a by catch when targeting Marlin with lures, especially at the beginning of the season. although fish in excess of 80 pounds have been caught. Also regularly caught as a by catch when targeting Marlin. 64 pounds. The biggest bulls are normally taken when pulling fast trolled marlin lures in deep water. to 50 pounds, but fish in excess of a 100 lbs have been caught out wide. crocodiles that can attain in excess of 80 pounds are mostly caught on downrigger rigged live baits. are regularly caught, with the resort´s record being a brute estimated at over 90 pounds. We have an exclusive T&R practice for this species. • 10 SPECIES OF KINGFISH (caranx & carangoides family) bluefin, yellowtail, longfin, big eye, brassy, yellow spotted, bludger, short fin and ferdy. • AFRICAN POMPANO, MIRRORFISH, LADY FISH, MILKFISH AND BONE FISH. · TROPEDO SCADS & GARFISH. Sportfisher´s, powered by new twin 175hp outboard engines. electronics and all other necessary equipment. craft can take a maximum of 4 anglers. and guests are required to bring their own. Predator and other´s. Circle and J hook live and skip bait traces and leaders. reed, soft-fringed thatch and wood in order to blend harmoniously with the natural surroundings. telephone access. A choice of separate, inter-leading and shared veranda chalets and villas are available. VAMIZI has been Mozambique´s top Marlin vessel, ranking up numbers not seen since the archipelago´s heyday´s of the 60´s and 70´s.